This is a guest post by Anoop Vijaykumar. Anoop is a SEBI Registered Investment Adviser and writes about equity investing at thecalminvestor.com. Follow him on twitter @CalmInvestor. A steel company is founded in 1995. It goes public ten years later. After listing, it grows revenue 14x over five years. That’s a 70% annual growth rate. Operating Profits grow at a relatively modest but still impressive 40%. In its first year, markets don’t take notice. After moving sideways for nearly two years, the stock moves 3X in under three months. Rumblings of a credit crisis start in the global markets. The stock corrects to IPO price, then goes even lower after the crisis sets in. Over the next 18 months, it gradually but steadily moves up past its IPO price. It delivers another year of 20%+ revenue and profit growth. A year after clocking ₹850 Cr sales and ₹50 Cr in Operating Profit, sales come down to ₹476 Cr with a ₹152 Cr loss. Over half the loss, is an exceptional item, a robbery. In its annual report, management says that “a factory shed, a building, heavy machinery, and finished stock” was stolen from its plant, nearly three months ago. The company suspends operations a few months later. True Story. It also came up with a finding that while 34% of large caps were still below their 2008 stock price in 2018, only 2% of micro caps were still below their historical prices. The reason, of course, survivorship bias. The data did not consider companies that “died” between 2008 and 2017. Survivorship Bias means that the steel company above does not appear in historical analyses of the performance of equities. 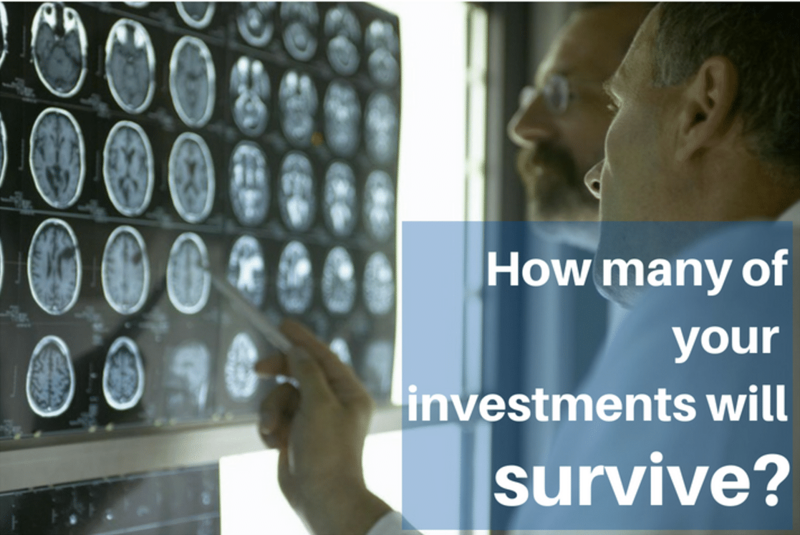 This also means most historical studies understate the risk of investing in equities. Turns out it’s hard to eliminate this bias. I looked at historical data on companies listed on the NSE. Of the ~2,400 companies that have listed on the NSE. Within those I identified those that ceased to survive in their original form. Then look for online archives to understand the cause. Here’s what came up. By survive, I mean, do not continue to exist in their original form. Let’s break it down. The remaining 20% do not. Of that 20%, 2% only have ticker or similar cosmetic changes while the other 10% have more significant changes like changing their names, getting acquired or delisting. 8% of companies “die” or cease to exist. ISIN or Ticker changes, Delistings, Merging with Parent company and Acquisitions are corporate actions that usually are not harmful to shareholders. They might even benefit shareholders if done right. The remaining two, Name Changes and outright “deaths” usually mean loss of capital for minority equity shareholders. Why is “Name Change” a significant shift for a company? To be fair, in some cases, they are innocuous, as rebranding exercises. But many seem an attempt by shady management to erase dubious activities in the past. Almost like a witness protection program, hoping new investors don’t form the link with an untrustworthy promoter. If a company has changed its name in the past, be more sceptical of the promoter’s intentions. If you must invest, then pay close attention to every quarterly report and conference call transcript. Go back in time and some of these failed companies were the toast of analysts and fund managers. Which of today’s darlings will be case studies in poor strategy and execution, flawed business models, corporate governance lapses? There are signs but there’s no sure way to tell. 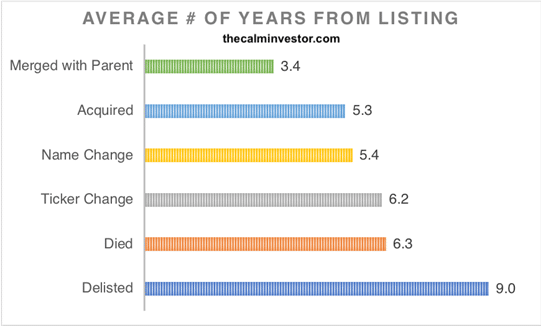 I looked at average number of years from listing to failure to get a clue. Companies with reasonably long histories also fail for all the reasons mentioned above. There are studies that say that the key to happiness is low expectations. Depending on the universe and timeframe considered (NIFTY vs NIFTY Next vs NSE 500), literature that says long-term are between 9% and 15%. If you believe one of five stocks will sink without a trace, that should downward adjust your expected return from a randomly selected basket of stocks. This is why you need a portfolio strategy and not just a stock-picking strategy. So when it happens, you don’t lose too much sleep. Look for skeletons in the promoter’s past. Run-ins with SEBI. Google searches show up dubious instances of cases of insider trading in past companies, other entities they have set up, then shut down. Believe that if the results are too good to be true, they probably aren’t. Vakrangee, Manpasand Beverages, 8k Miles have high-quality businesses, on paper. They make it through every quality screen. Means little if those numbers can’t be trusted. No matter how they seem, there are NO stocks you absolutely must invest in. When in doubt, pass. Overall, either make sure you get your stock selection right through a clear time-tested process or just buy the index systematically. Anything in between is dangerous. If invested in a company that later throws up red flags, take a dispassionate look and exit. Too many investors get emotionally invested in their holdings and refuse to see the signs. There still are zealots for some of the companies mentioned above posting fervently on discussion forums about how the worst is behind them, and that the new auditors have confirmed the cash is real. Don’t be that guy. Finally, know that only hindsight is 20-20. Some of your investments will fail. And that’s ok.